Check your Scratchers Ticket for "Pinning"
You dream of big bucks when you buy that Scratchers ticket. But Vicky Nguyen shows you a new scheme could be cheating you out of any chance of winning. You might think of players trying to game the system, but when it comes to Scratchers — it’s the retailers who are on the radar of law enforcement. The newest scheme is called pinning, and it allows cheaters to keep the winnings for themselves, while selling unsuspecting customers the losing tickets. Scratchers are the California Lottery’s cash cow. Last year players spent $2.7 billion on the scratch-off tickets. The odds of winning big money are long enough, without cheaters like the store clerk in San Jose, caught on his own surveillance cameras. Lottery investigators say when he wasn’t working the counter, he was working over his customers, selling scratchers he *knew* were duds. How did he know? Because he’d already checked them. 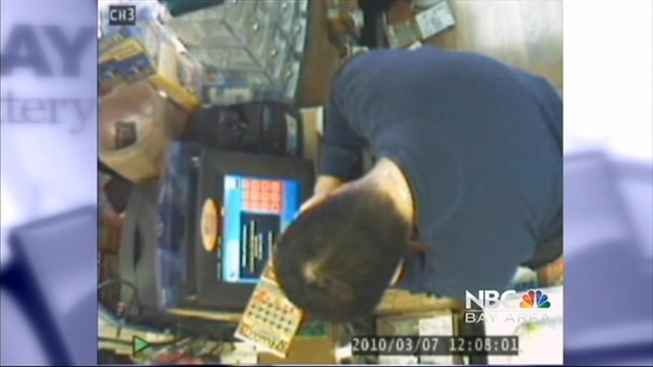 In surveillance video shared with exclusively with NBC Bay Area, you can see the clerk lean over a stack of tickets. Investigators say he’s removing a tiny bit of the top layer of the ticket, to reveal each Scratchers’ unique three-digit code. That code, plus the ticket’s barcode, tells him if it’s a winner. Police say he set the losing tickets aside to sell to unsuspecting customers. The crime is called “pinning” because the cheater uses something small and sharp like a pin to remove a thin line of latex on the ticket. Even frequent players can be fooled, because unless you look closely, you’d never notice the small scratch. “It’s a big enticement. There are millions of dollars at stake out there,” said Lt. Rick Linson, acting chief of the investigative unit of the California Lottery. Yes, the lottery has its own police, and they don’t suffer thieves. “I look at this as stealing from the children,” said Linson. That’s because the lottery paid $1.3 billion to California schools last year. Police say they investigate to keep the games fair and honest, so that you’ll keep playing. Investigators say they caught the San Jose clerk on tape selling three pinned tickets — and they confiscated 50 more. In that case, his own video contributed to the arrest, according to police. He was arrested, lost his lottery contract, and the liquor store shut down. Linson says in other pinning cases, suspects tried to cover their tracks with the correction fluid “Wite-Out,” literally painting over the layer they scraped off. “[That works] because most of us think the lottery product we’re getting is solid,” said Linson. The California Lottery’s 37 investigators conduct regular, random undercover stings statewide to make sure retailers aren’t tempted into cheating the system. They also investigate every complaint they receive; last year they checked into more than 2,700 reports. In another video shared only with NBC Bay Area, an undercover officer took a decoy Scratcher worth $10,000 to a convenience store in San Jose. Investigators say they received a report that the clerk attempted to keep a winning $500 ticket for himself. Police say he kept the ticket, and a month later his wife tried to claim it. She told investigators she bought the ticket. They were both arrested, fined, and no longer sell lottery tickets. But investigators say overall, the system is honest, and cheaters are the minority . Acting chief Rick Linson says 95 percent of the stores pass their random checks. That’s up from 87 percent two years ago. He says anyone who tries to game the system should know lottery security is built to catch cheaters, sooner or later. “Ultimately you’re gonna get caught,” said Linson. Investigators say if you suspect your ticket has been tampered with, you should file a complaint with the lottery by clicking here or calling 1-800-LOTTERY (800-568-8379) or TDD: 855-591-5776. Now for a look inside the most secure room at the California Lottery Headquarters in Sacramento, check out this video. You'll also see how winning claims are handled. Hint: They have their own elevator.